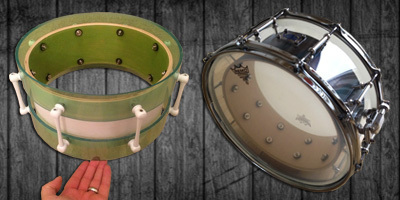 We can offer a wide range of shells, if it's out there we can make or source, most of our snares and kits tend to be maple or birch. See below to find out more about what we offer, In the words of Home Alone "This is it, dont get scared now!" 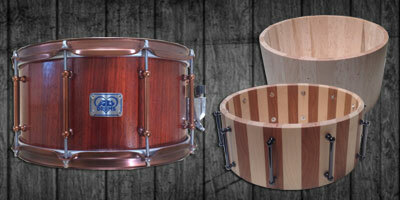 Our birch shells are build like houses and offer a solid workhorse feel for around 70% of what we manufacture. 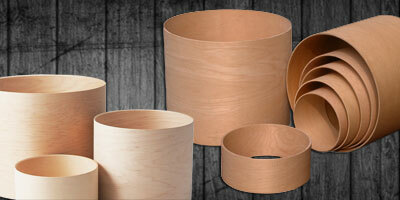 With 6plys and 6mm thickness there is more wood and less glue meaning more tone! We offer Keller maple shells which come in a range of thicknesses and plys, let us know what sizes and style you play and we can offer guidence in to what we feel will work best. If you want the more vintage tone why not go all out and use Mahogany, lower in tone wth a warm edge that makes drums feel and sound like they were made back in the day. We can souce a vast amount of veneers to add to any given shell, these vange from more standard woods like walnut and sapele to exotics like bubinga and zebrano. When Acrylic meets wood! 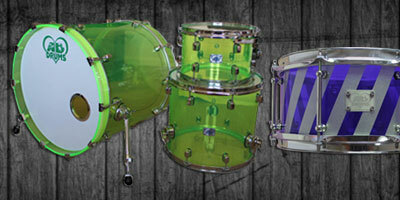 These shells create some of the most visual and cool tones out. Most commonally we create these with Maple of birch shells, veneers and wraps can be applied to if stains and paint arnt crazy enough for you. The use of LED lighting can really set these off. 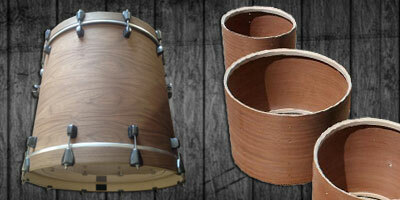 We can also produce acrylic shells with wooden plys inside too. 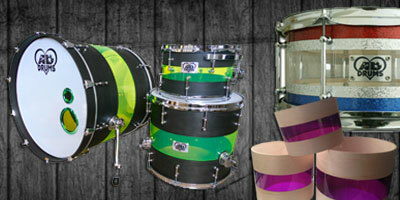 Available in a vast array of colours these shells bring out the Bonham in all of us. We offer some very unique ways in customising our acrylic shells if the see through look just isnt enough, this includes paint/sand blasting/wraps/veneers and decals. Our LED lighting system can also be added to any of our acrylics. A wide range of exotic woods can be used to create these monsters in the shell scene, we love beer and made just like a barrel these shells offer a tonal range that will blow your mind (and ears of course). Whats this i hear you scream???? 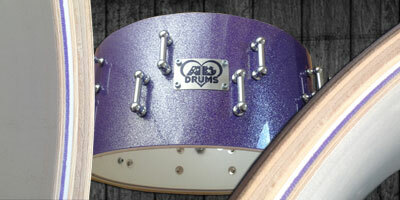 in all the years of experimenting behind the scenes we have created a shell thats unique to AD using plastic withing our wooden plys we can offer a sound that mixes the best between acrylic and wood all blended in to one, alot like the hybrid tone with a different look and feel. Mainly suited to snares this is when the shell is in two halfs and held together by the drums hardware, like vents these produce a very loud intense sound. A shell within a shell! Great visuals can be created with these drums let alot a very unique tone. 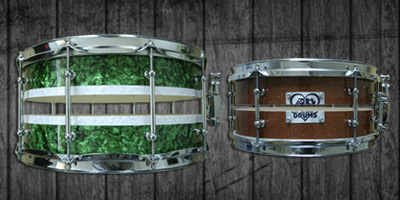 Mostly suited to snares but can be applied to whole kits.